At the risk of sounding like the “Grumpy Old Man” skit Dana Carvey used to perform on Saturday Night Live, 2009 was the most lackluster year for film in over a decade. Don’t get me wrong: there were a number of superb movies and acting performances. But, unlike every year I can remember, there was not those one or two films that stood apart from the rest and achieved a measure of greatness. The reasons for this slump – an opinion shared by many critics more seasoned than myself – are wide-ranging but ultimately inscrutable. James Cameron returned to directing feature films, Quentin Tarantino took time off from sitting on film festival juries and the talk show circuit to add to his directorial catalog, and Pixar submitted its annual superlative entry. But, many of the decade’s most accomplished filmmakers were absent from theaters this year, including Paul Greengrass, Christopher Nolan, Darren Aronofsky, P.T. Anderson, Alfonso Cuarón, Alejandro Iñárritu, Steven Spielberg and Martin Scorsese. Films from Peter Jackson, Clint Eastwood, and Steven Soderbergh met with mixed reviews, while Rob Marshall and Ang Lee threatened to make us forget they were ever competent directors. Moreover, a decade-long decline in quality roles for female actors reached its ebb in 2009. Just when a woman seems poised to finally win the Best Director Oscar, the search for outstanding lead actress performances this year is like going on an egg hunt two weeks after Easter. A search of festival circuit and indie cinemas might have unearthed such hidden gems as Carey Mulligan in An Education, Tilda Swinton in Julia, and Michelle Monaghan in Trucker. But, while Meryl Streep is perhaps the finest female actor of our time and was delightful as Julia Child in Julie & Julie, when a role as slight as this – in a film as forgettable as this – catapults to the top of probable Oscar winners, it is a dilemma that portends an industry-wide plunge. Indeed, the bulk of our most decorated film actresses not named ‘Streep’ spent 2009 marooned on the shipwreck Nine. What is heartening about this year’s best films, however, is the sizable number of young and/or unheralded directors already putting their stamp on the film scene. In a year when the big names were AWOL, the up-and-comers pulled up the slack. So, without further adieu (or more talk about how things were “back in my day”), here are my selections for the best and worst movies of 2009. Best Film of 2009: (500) Days of Summer – This anti-love love story eschews the insipid troupes that have gradually atrophied the romantic-comedy genre. Instead, it is an examination of infatuation and, more commonly, the kind of white-hot romantic relationships that often burn out as quickly as they ignite. And, director Marc Webb’s underrated visual expressionism is captivating and humorous without becoming indulgent. This is a witty, refreshingly original portrait of Gen-Y love that speaks to audiences of all ages. Although it punctures the illusion of happily-ever-after, the film’s affirming final scene reminds us that love is always just another season away. 2. The Damned United – The criminally ignored biopic is a sports-related movie, but it’s not the typical “sports movie.” The story of famed British soccer coach Brian Clough – portrayed brilliantly by the equally undervalued Michael Sheen – and his ill-fated 44-day stint as head of top-flight Leeds United in 1974 – contains little actual game play, and reverses the typical sports movie story arc; here, success turns into failure. Screenwriter Peter Morgan fashions a character study of the corrosive effects of pride and obsession, all revolving around an underdog whose success blossoms only on fields barren of expectations. 3. The Hurt Locker – The first worthy movie set around America’s current war in the Middle East is an exploration of a soldier’s survival instincts and their eventual war-torn psychological distortion that the only way to feel alive is to keep facing death. Newcomer Jeremy Renner is superb as a hotshot “blaster” whose mission is to defuse or otherwise nullify enemy mines and IEDs. Director Kathryn Bigelow returns after a seven-year layoff to not only fully realize her filmmaking potential, but perhaps become the first woman to win a Best Director Oscar. 4. Up in the Air – Working within his now-established formula of quirky romances set within tableaus informed by weighty social topics, director Jason Reitman crafts a time ly and timeless film that hearkens back to such worldly comic masterpieces as Billy Wilder’s The Apartment, Ernest Lubitsch’s The Shop Around the Corner and Preston Sturges’ Sullivan’s Travels. George Clooney lends his trademark retro leading-man charisma to a middle-aged “career transition counselor” facing a personal crossroads. Playing his respective coworker and love interest, Anna Kendrick would feel right at home in a screwball comedy while Vera Farmiga radiates the sophisticated sexuality of classic film noir divas. 5. The Messenger – Ben Foster and Woody Harrelson play two casualty notification officers who give notice to the families of fallen soldiers who died in Iraq and Afghanistan. An ethical dilemma unfolds when Foster’s character becomes involved with a widow played by Samantha Morton. These are three of the best acting performances of 2009 in an intelligent, affecting screenplay co-written by debut director Oren Moverman. 6. Up – This is – say it together – “Pixar’s annual entry in the best films of the year.” When an elderly widower (Ed Asner) – drawn and voiced to resemble a sexagenarian Spencer Tracy – faces encroaching urban sprawl and involuntary relegation to a retirement home, he decides to follow through on he and his late wife’s promise to one day journey to the wilds of South America by literally floating away and planting their fixer-upper dream home atop the mystical Paradise Falls. This is mature animated filmmaking that will make you laugh and cry…and that’s just within the first 15 minutes. It is a film about longing and discovering that adventure isn’t necessarily “out there,” but may be closer to home. 7. District 9 – This sci-fi thriller from director Neil Blomkamp depicts the chaos and racism that ensues throughout Johannesburg, South Africa when extraterrestrial aliens become marooned on Earth and att empt to integrate into human society. The faux-documentary approach that dominates the film’s opening half lends an unsettling verisimilitude to the aliens and their earthly subculture. The second half revolves around a government agent (Sharlto Copley) who contracts a strange virus that begins to slowly transform his DNA and appearance into that of an alien. There’s obvious analogy between the treatment of the aliens and human racism. The most difficult question facing audiences members is – if faced with the reality of such extraterrestrials living among you – whether you would actually support the restrictive, oppressive measures designed to keep them at bay. 8. Goodbye Solo – Ramin Bahrani’s third critically acclaimed feature film – after Man Push Cart and Chop Shop, (# 7 on last year’s list) is an ethereal meditation on mortality and displacement centered around an African immigrant cap driver (Soulyemane Sy Savané) and his taciturn fare, a septuagenarian (erstwhile Elvis bodyguard Red West) bent on ending his life. From its nocturnal forays through Winston-Salem, North Carolina’s downtown tobacco district to the striking imagery atop Blowing Rock National Park, this film’s haunting air lingers long after its closing credits. 9. The Road – This ultra-faithful adaptation of Cormac McCathy’s bleak, post-apocalyptic novel is a survival story about a Man (Viggo Mortensen) and his Boy (Kodi Smit-McPhee), who embark an odyssey that embodies the dual meaning of the film’s title. Their trek carries them down treacherous highways and byways, and their journey carries with it mankind’s path toward rebirth and redemption. Director John Hillcoat (The Proposition) wields a keen command of craft, setting, and atmosphere. 10. 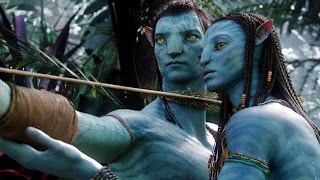 Avatar – James Cameron’s epic return to feature filmmaking after his Titanic rainmaker reestablishes him as the DeMille of our time. What separates Cameron from the Michael Bays of the world is that his visual masterworks are accompanied by a soul. The film’s post-9/11 symbolism is a bit heavy-handed. But, this giant leap forward in the art of moviemaking deserves recognition. Admit it: you’re already counting-down until the Blu-ray DVD release. Worst Film of the Year: All About Steve – It’s a good thing this monumental misfire – concocted by the same screenwriter as the equally wretched License to Wed – was released before, not after, Sandra Bullock’s Oscar-bait turn in The Blind Side. Otherwise, it would have been her Norbit. Bullock plays Mary Horowitz, crossword puzzle writer and a single flibbertigibbet living at home with her parents. A blind date with a television cameraman (Bradley Cooper) both stokes Mary’s carnal fires and sends her freak flag flyin’. It is not just that Mary is exceedingly annoying; what’s more disconcerting is that Mary is so clearly psychotic that it is impossible to find any modicum of humor in her eccentricities. When I reviewed the movie in September, I wrote this “is the first film unworthy enough to be considered the worst movie of this year. Here’s hoping I am not unfortunate enough to endure anything that threatens to steal its crown.” I wasn’t, thankfully.